It surely is a somewhat dated Windows Phone device, but still is one of the best, especially if you are still looking for a great entry Windows Phone device. 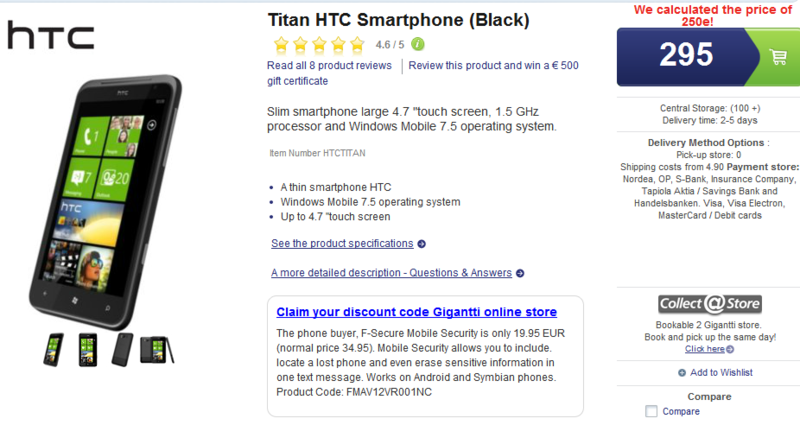 Through Finland-based website Gigantti the HTC Titan is available unlocked for only 295 Euro. The HTC Titan unfortunately will not receive the Windows Phone 8 update later this year. It will receive the Windows Phone 7.8 update, but as we said this device is still heavily worth purchasing for anyone that is new to the Windows Phone world. The 4.7″ SLCD display and 8MP camera are what make the HTC Titan a great Windows Phone to own, still to this day. The HTC Titan also has a 1.5 GHz processor, 16 GB internal memory, and even a 1.3MP front facing camera. Visit the Gigantti HTC Titan product page for more information and to place your order.